Please visit my husband Larry's Blue Rose Foto page!! A sliding scale fee is also available depending on your circumstances. Example: a local Equine Rescue uses my service/sessions quite exstensively for which they receive a nice discount. Physical distance between your animal and me is not an issue. I can connect with them wherever they might be. 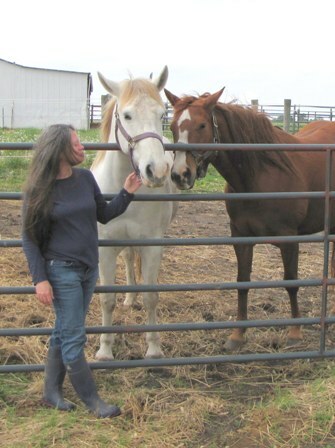 To date, I have worked only with horses, dogs, and cats (oh, and one skunk on our farm - asked to please move on, and she did!). I haven't tried with any other animals because I haven't been asked to, yet. Right now, I like to work over a 2 to 3 day period with 3 different "connections" with your animal as opposed to trying to connect with them while I'm on the phone with you (if you phone). At this point, I need to be in a quiet place without a lot of distractions in order for me to focus on "listening". I have connected with animals that seemed hesitant to connect. They felt a bit trepidatious or as though they were standing back from me not quite sure what to think. I gave them time to "smell" me, as it were, and in the next connection they were willing to talk. I also like working over a period of time to get a sense of a larger picture. The facets of personality come out more over a period of time. I get a more balanced impression. Also, I had one experience when a horse's communications just weren't making sense to me. I couldn't make heads or tails out of what I was hearing. Finally, I heard from the animal, "Will you call me back? I want to go back to sleep." I did, indeed, "call back" in the late afternoon (apparently after nap time!) and got all the information I was seeking. So...email or phone in the questions you wish to ask of and/or the information you wish to convey to your animal. If you wish to convey your information by phone, leave a message on voice mail if I am unavailable and I will return your phone call as soon as possible so we can either talk then or set up a mutually convenient time for the initial intake. After my first connection with your animal, I will email or phone in case the communication inspires further questions and dialog. Please be aware that we are in the U.S. Central Time Zone and would appreciate any phone calls to be after 10AM and before 4PM CST/CDT. Weekend calls are fine as well. The above bullet points about what I do are the short version. Please click HERE for a more descriptive explanation of what I do and how it works.